As a full-time traveler who rarely makes it back to the fine city of Pittsburgh, it’s not always easy for me to find a bar that will be showing the Steelers’ game, let alone even find out when the game is playing. The official website isn’t exactly iPhone friendly, and Google does produces strange random results when all I want to know is exactly when the game will be on and what network will be carrying it. Without further ado, here it is. Press and hold to save to your iPhone or Android device! Or you can simply save this link to your bookmarks. 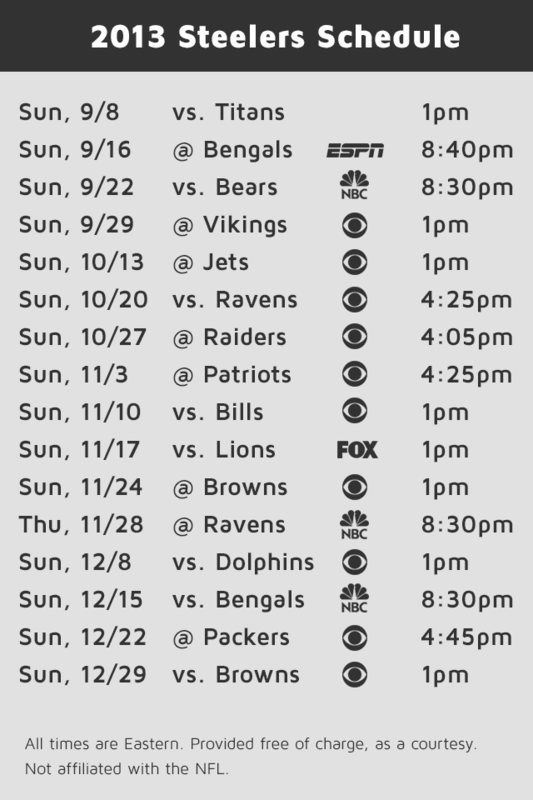 Hey, Here is a site that show’s you how to put the schedule right on your iPhone’s calendar: http://iphonesportscalendars.com/nfl/#steelers. They have other sports and teams, but figured you’d be interested in the Steelers. Tumblr, Making Fun of themselves?